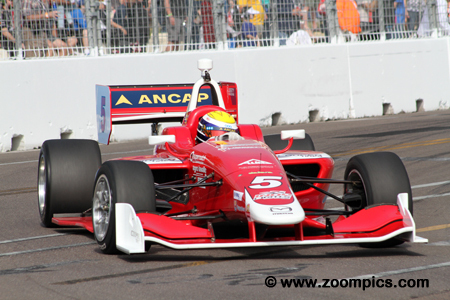 The Indy Lights series originated in 1986 and was called the American Racing Series (ARS). It served as a training ground for racers with the intention of competing in CART (Championship Auto Racing Teams). Indy Lights is now considered the top rung of the ladder for Mazda’s Road to Indy. The Mazda Road to Indy is a driver development program, providing a scholarship-funded path to reach the Verizon IndyCar Series and the Indianapolis 500. The first generation cars used in the American Racing Series were manufactured by March and powered by a Buick V6 engine. Since then a number of different chassis and engine combinations have been used. In 2015, Indy Lights competitors started racing a Dallara IL-15 chassis powered by a 2.0-liter turbocharged Mazda MZR-R motor. The championship has proven to be a successful training ground for some of the drivers competing in the 2018 Verizon IndyCar series – Marco Andretti, Tony Kanaan, Scott Dixon, Josef Newgarden, Spencer Pigot, Ed Jones, Gabby Chaves, Helio Castroneves, James Hinchcliffe, Graham Rahal, etc. The 2018 Indy Lights season opened with rounds one and two at Saint Petersburg, Florida. This event is followed by doubleheaders at Barber Motorsports Park and the road course at the Indianapolis Motor Speedway. The Freedom 100 will be held on the oval at the Indianapolis Motor Speedway. Road America with host race eight and nine in the series. Road America is followed by an event at Iowa Speedway. Next up are doubleheaders at Toronto and the Mid-Ohio Sports Car Course. The penultimate race weekend will be at Gateway Motorsports Park. The final two rounds of the season will take place at Portland International Raceway. 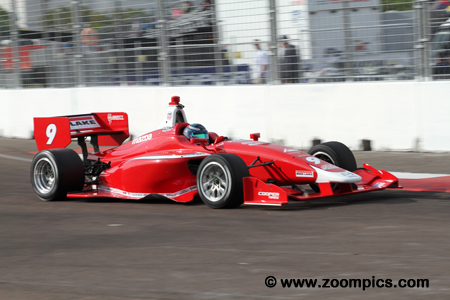 The first two events of the 2018 Indy Lights championship presented by Cooper Tires were held at the Grand Prix of Saint Petersburg. Drivers would compete in two races (Saturday and Sunday) around the fourteen-turn 1.800-mile temporary street course. The start of the first round of the 2018 Indy Lights championship presented by Cooper Tires. Lap one and nine entries rush into the first corner at Saint Petersburg. Leading the way is the No. 27 Andretti Autosport Dallara, driven by Pato O’Ward. 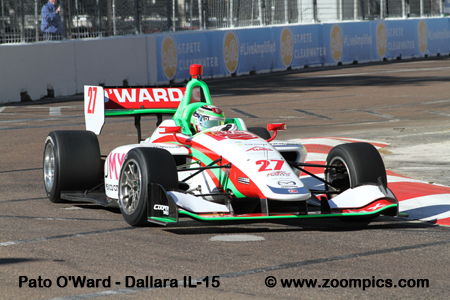 Falling in behind, O’Ward is the Belardi Auto Racing Dallara of Santi Urrutia. On the outside is the No. 98 Dallara of the second place starter, Colton Herta. 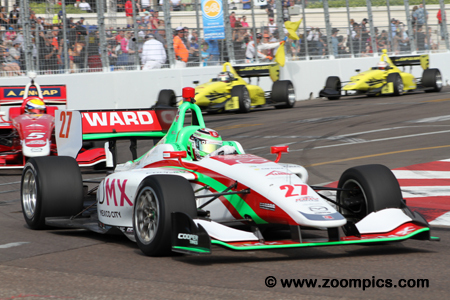 Mexican, Pato O’Ward had a great start in the season’s first race. O’Ward qualified second in the Andretti Autosport Dallara but inherited the pole when Aaron Telitz crashed his car. He led all thirty-five-laps to score his first Indy Lights win. 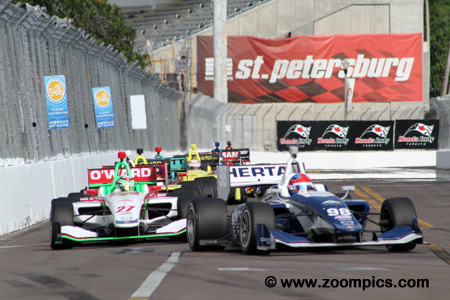 The following day, Colton Herta passed O’Ward at the start but O’Ward was back in the lead on lap-5. An error by O’Ward in the braking zone at turn four resulted in a seventh-place finish. The No. 98 Andretti-Steinbrenner Racing Dallara was driven by Colton Herta. Herta was third quickest in the first qualifying session but shared the front row with Pato O’Ward after Aaron Telitz’s accident. He had a terrible start, losing several positions but managed to finish third and set the fastest race lap. On Sunday, Herta jumped from second to first and led the first five laps. Unfortunately, he crashed and retired on lap-9. The podium for round one of the 2018 Indy Lights championship. To the right is the third-place finisher from Andretti-Steinbrenner Racing, Colton Herta. On the left of the rostrum is the runner-up, Santi Urrutia who is a member of Belardi Auto Racing. 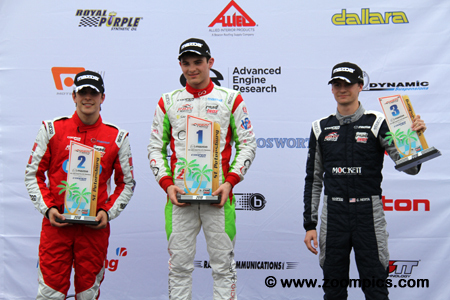 In the center is another Andretti Autosport driver, Pato O’Ward who scored his first series victory. It was a terrible start to the 2018 season for Aaron Telitz the 2016 Pro Mazda champion. The driver of the Belardi Auto Racing Dallara qualified on the pole for the weekend’s first race but a crash during the second qualifying session left the car severely damaged. Unable to start the first race, arrangements were made with Carlin Racing to borrow a car. Unfortunately, contact with another car forced Telitz to retire on lap one. There was some redemption for Colton Herta in the weekend’s second event. After a miserable start on Saturday, Herta got the jump at the green and passed the pole-sitter, Pato O’Ward in corner one. 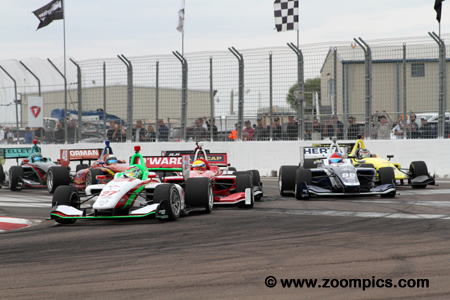 Behind Herta heading into Saint Petersburg’s turn-ten is the round one winner, O’Ward and the other drivers. Unfortunately for Herta, his good fortune only latest eight laps. The big winner in the opening rounds was Santi Urrutia. 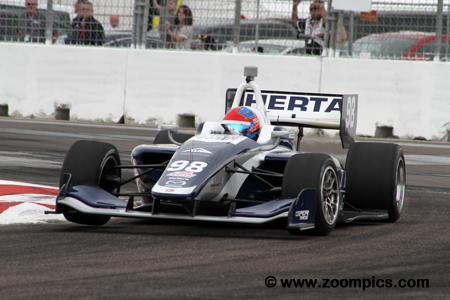 The 2015 Pro Mazda champion from Uruguay started Saturday’s event fourth. With Aaron Telitz unable to start the race and Colton Herta’s miscue on the first lap, Urrutia finished second – 6.6014-seconds behind the winner, Pato O’Ward. The following day, he started sixth but problems for Telitz, Herta and O’Ward allowed him to take the victory and championship lead. 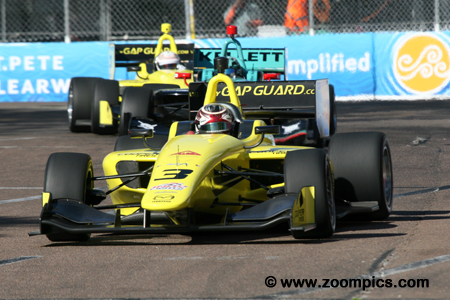 Shelby Blackstock signed a one-event deal with Team Pelfrey to compete in the team’s No. 3 Dallara. Blackstock qualified seventh in race one and finished fifth. On Sunday, he was gridded eighth for the start. When Colton Herta crashed, Aaron Telitz and Victor Franzoni had contact and Pato O’Ward made a driving error, Blackstock inherited the runner-up position. This was a career-best finish in fifty-two Indy Lights starts.